The camera gear aimed at Queen Avenue, photographed in February 2017. 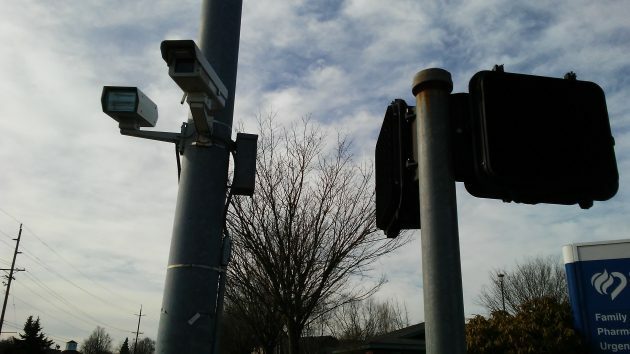 Something else has come up concerning Albany’s lone array of red-light traffic cameras, but before we get into that, let’s remember the obvious: We don’t have to worry about getting a camera ticket if we stop when the light turns yellow or red. The new thing I learned about the cameras at Queen Avenue and Geary Street is this: Early last year, Redflex, the company running the cameras, increased the sensitivity of the pavement loops that detect vehicles as they pass. This caused the number of camera activations to more than triple, from about 1,400 in 2016 to more than 6,000 last year. It also resulted in 1,045 traffic tickets for failing to obey a signal there in 2017, just about twice the 519 that were issued the year before. In any case, Hurley says the police noticed a spike in Redflex reports starting in May. Each reading of a potential violation has to be individually checked to see if a citation is warranted. And the onslaught of observations caught by the cameras at times overwhelmed the department’s capacity to process and evaluate all those pictures and videos. It’s apparent that the cameras didn’t catch all violations before the sensors were boosted. But it’s also clear that now they are often tripped when there’s no violation clear enough to warrant a ticket. Hurley told me the department is working with Redflex to fine-tune the system’s algorithms so that it does not come up with as many unnecessary observations as in 2017. A report compiled for the legislature and covering the year 2016 sheds light on why tickets are not issued even though the cameras have gone off. For instance, in 201 of the 1,408 observations that year, drivers had stopped after all, albeit past the stop line or even in the crosswalk, to make a “safe turn on red.” It’s a technical violation, but no cop would issue a ticket for it. In 84 cases, there was an apparent “gender mismatch,” meaning the driver looked like a female while the registered owner was male, or vice versa. In 91 cases, there was a problem with DMV records that were either incomplete or wrong. In yet other instances, the photos were not usable because the vehicle could not be identified or the driver’s face could not be made out, or for various other reasons. And in more than 200 cases, the violations were “too old.” Under the law, the police have 10 business days to issue a ticket. And with hundreds of camera activations coming in to be reviewed, you can see where an officer assigned that task might fall behind. When did Mr. Hurley take over “handling the Reflex program”? The early renewal of the Contract was signed by Captain Eric Carter and lists him as the Contract Administrator. Was the report compiled for the legislature covering the year 2016 prepared by Mr. Hurley or Capt. Carter? Interesting that the sensitivity adjustment didn’t occur until AFTER the contract was renewed for another 7 years. There might have also been a large increase when drivers realized they can trip the light by coasting just up to the cross walk and stopping abruptly. Let’s shoot for 100,000 incidents! Maybe you can get rid of the cameras if you overwhelm then enough? Which also begs the question- How many people that made a proper R turn, but were caught in the intersection when a south bound vehicle decided to “flash” the camera? Maybe every R turn violation issued should be reviewed to make sure this wasn’t the possible cause? Bill, an officer reviews every single picture before ANY citation is issued. But what if the person making the R turn has stopped and then is legally making their turn while a car pulls up in the inside lane and trips the light. You apparently don’t understand that you can trip the light by stopping abruptly “just short” of the crosswalk. I know of a person that does it for “sport”. If you don’t stop you deserve the citation. Period. Just creepy! The “company” can “increase sensitivity” at a whim. A human interprets the violations. No doubt given a large caseload over a short time frame to complete. Rush RUSH Rush. Instead of overwhelming this intersection as one “commenter” suggested, all should avoid it at all costs. Time, gas to drive around, wear and tear on the car, etc. Picture a boycott. Blame Obama. Ha ha, I don’t care.